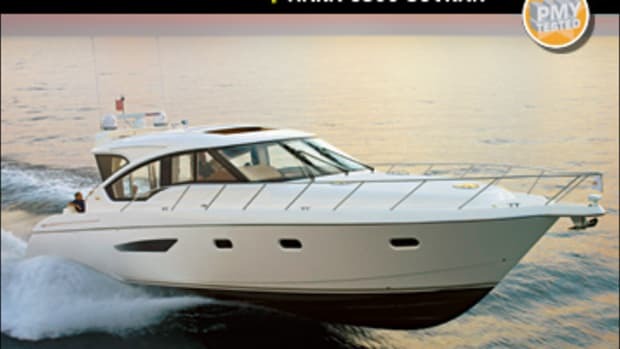 The Tiara 4500 Sovran is everything a sportscruiser should be . . . and more. As some of you may have noticed, I’m new here. I came onboard PMY back in July in part to help write some of our boat test columns, and have been apprenticing for the good Captains Thiel, Pike, and Sciacca ever since. I thought I knew a lot about boats when I got here, but as most of you already know, there’s always more to learn. And man, have I learned a lot. So much in fact, that the Powers-That-Be (for my purposes, Thiel) decided that I was ready to test a boat myself. 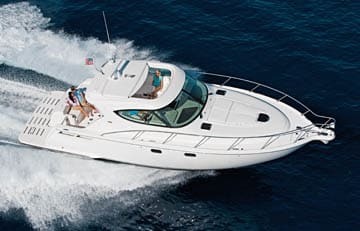 So I (as well as my handler, Sciacca) booked a flight down to Charleston, South Carolina, to give the Tiara 4500 Sovran sportscruiser a good run. She would not disappoint. I first caught a glimpse of the 4500—the second-largest build in the Sovran sportscruiser line—at the end of a long dock that reached out into Charleston Harbor. She had obviously been spiffed up for the occasion, her all-white exterior gleaming in the warm, early-December sun like a movie star’s smile. Stepping aboard via her sturdy swim platform, which can hold up to 1,000 pounds, the first thing I noticed was a good-size Kenyon grill in her transom. The grill was perfectly situated for firing up a couple burgers or the daily catch and came with stainless steel splatter guards that folded up to protect passengers in the cockpit from any wayward grease. To me, the grill would come to represent a microcosm for the boat—its primary focuses being family fun and safety. Moving forward, I noticed the cockpit made good use of available space, with ample stowage beneath the seating and an all-purpose table that flips up on hinges to create more room for moving around. The entire cockpit lifts up hydraulically to reveal a relatively large, easily accessed, and well-insulated engine room housing a pair of 435-hp Volvo IPS600s. Tiara business development manager John Armbruster assured us that the engine room’s noise insulation combined with an IPS system that pushes exhaust out from the center of each drive would make for an exceptionally quiet ride—a claim which we were eager to put to the test. The diesels are fed by a single 375-gallon tank that’s mounted forward beneath the cabin sole, where a changing fuel load will have minimum impact on running trim. Tiara recently switched its tanks from aluminum to pre-cured fiberglass due to concerns over possible corrosion causing fuel leakage. The helm and upper cockpit area proved to be particularly amenable to family living. 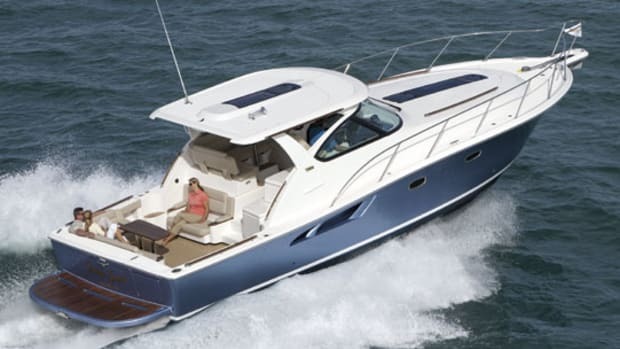 In response to customer requests, Tiara installed a two-seat helm—an upgrade from the single-seater on its 43-footer—which could easily fit a captain and a kid, or maybe a captain and his dainty wife, though I found the seat too close for comfort with two grown men occupying it. Our helm was also outfitted with optional and easy-to-read Garmin widescreens. To port there was an 15-inch Sharp TV (also an option)—one of four that were installed on our test boat. (Why anyone would feel the need to stuff four TVs into a 45-foot boat I have no clue.) Above, there was another feature that I found exceedingly thoughtful on Tiara’s part. When closing, the automatic sunroof stops a few inches short, requiring a second push of a button to shut tight, so as not to clamp down on an unsuspecting tot’s fingers (or worse). Lastly, a single, center-aligned pilaster girds the expansive windshield, creating helm and cockpit visibility that is truly excellent. Down below I immediately noted the teak-and-holly sole—the teak is old growth and thus flaunts a good deal of charm and well-earned character in its grain. The rest of the interior put on a clinic in safety and accommodation. Indeed, Tiara may be obsessed with its customers’ safety onboard. 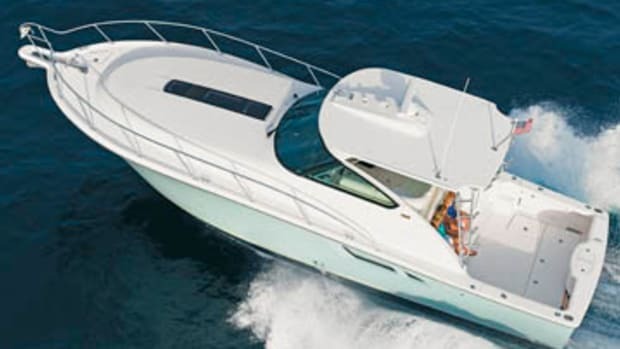 The 4500 comes equipped with smoke detectors, which strangely aren’t a requirement of the American Boat and Yacht Council (ABYC). She also has an easy-to-operate escape hatch in her (of-course-TV-equipped) guest cabin, another safety feature not required by the ABYC—and a particularly salient one considering that that’s where the kids would most likely be quartered. Also of note is a recessed Kenyon cooktop in the well laid-out galley. (One of those aforementioned things I’m still learning about boats is that a stove is not ABYC-approved unless it is either recessed or has a searail around it.) The master cabin is located in the bow and is roomy enough, but what really impressed me was the size of the shower in the en suite head. I’m six feet tall, but it didn’t seem cramped at all. We pushed off from the dock into a picturesque, historic-mansion-lined stretch of Charleston Harbor just as the pinkening sun embarked on its daily slide down to meet the horizon. The 4500 knifed through the dark, flat, calm with grace as a dolphin leapt in the air and plopped lazily back down off our bow. “You see that?” I asked Sciacca, pointing at the ripples. “Keep your mind on the boat, not the wildlife,” he admonished. “They live here, and you don’t.” Good advice. I took the 4500 all the way up to a WOT speed of 37.2 mph at 3630 rpm, and even there, true to Armbruster’s word, the helm and upper cockpit area remained remarkably quiet: We barely had to raise our voices to converse. The steering was remarkable as well. 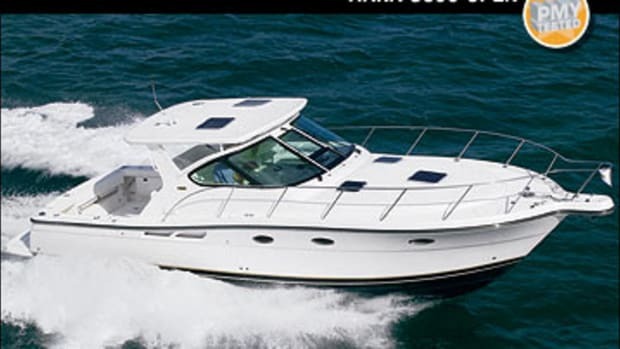 As I S-turned her through the channel, the boat felt more like a personal watercraft than a 45-footer. And when I turned her hardover at cruise, she whipped around in about two and a half boat lengths. I would have liked to have tried out her modified-V hull in the three- to four-foot chop roiling outside the harbor, but the encroaching darkness had other plans. Plus, I still needed to spend a little time with the Volvo Penta joystick docking system, so we high-tailed it back in. Back at the marina, the Tiara company rep, Capt. Drew Bartlett, kept telling us that maneuvering the 4500 using the joystick was so easy that the day before he had taught a monkey how to do it. In fact, he was so insistent that I’m still only about 85 percent sure he was joking. But I’ll tell you what he was definitely not joking about—the Volvo Penta joystick makes it unbelievably easy to position this boat. Back, forth, sideways, spinning—you name it, the 4500 responded immediately and with just the right amount of oomph. I was always in perfect control. In fact, it felt like I was playing a video game. 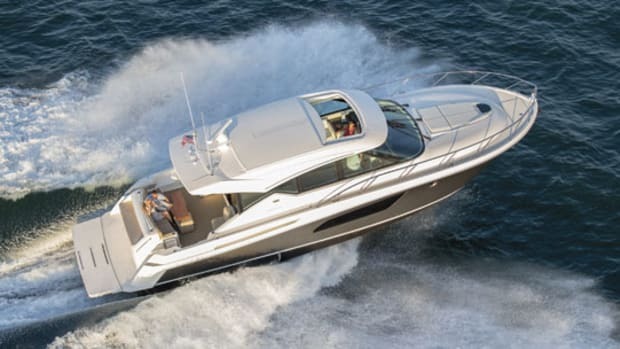 I now see why people say the joystick is an exceptional innovation, as buyers who otherwise would not feel comfortable squeezing a 47-footer into a narrow slip are now able to do so with complete confidence. 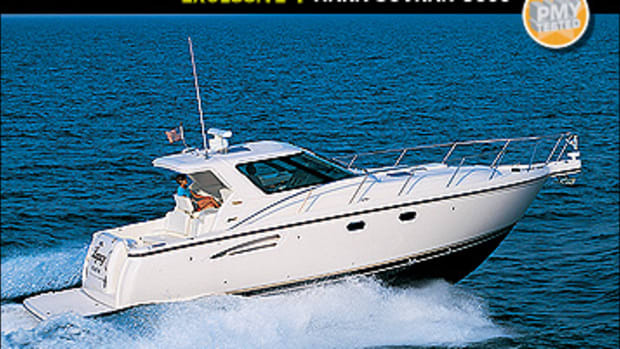 All in all, the 4500 is a boat well designed for its intended use. 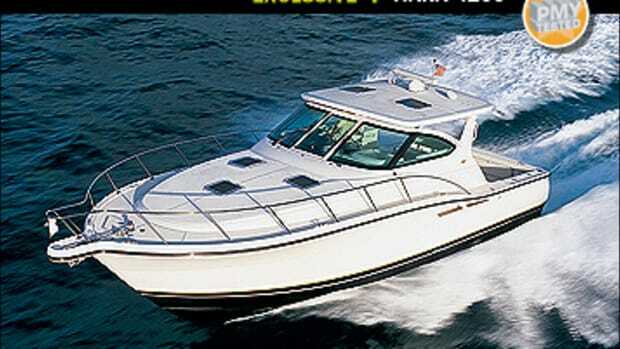 It excels as a day cruiser, can more than handle two guests for a few overnights. It’s also quiet, athletic, and replete with features that should keep you and your family safe and happy for years to come. Not a bad boat at all to draw for my first PMY boat test. 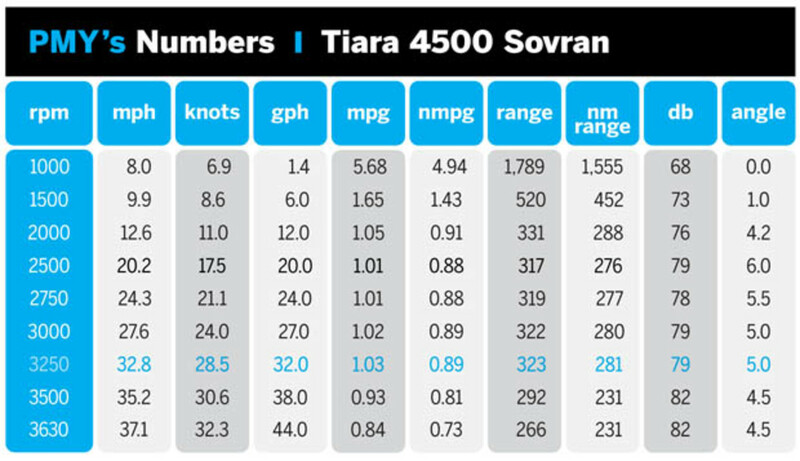 Here’s hoping that being assigned the Tiara 4500 wasn’t just beginner’s luck. Speeds are two-way averages measured w/ Garmin GPS. 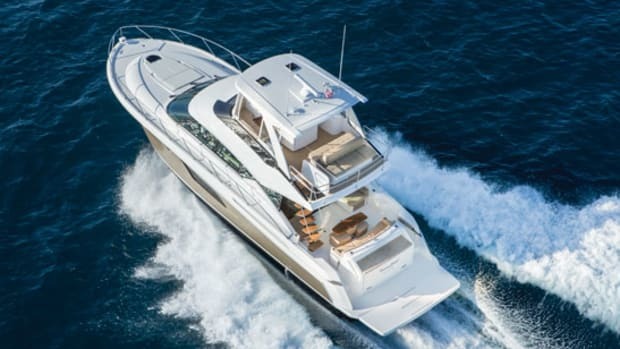 GPH taken with Volvo Penta electronic fuel-monitoring system. Range is 90% of advertised fuel capacity. Decibels measured at helm on A scale. 65 dB is the level of normal conversation. 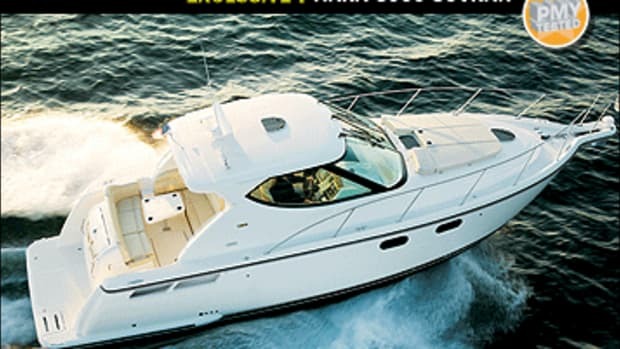 This article originally appeared in the February 2011 issue of Power & Motoryacht magazine.